Having finally regained the ability to move about, your humble narrator is loosed once more upon an unsuspecting borough, slaking his jaws and coveting quivering delights. 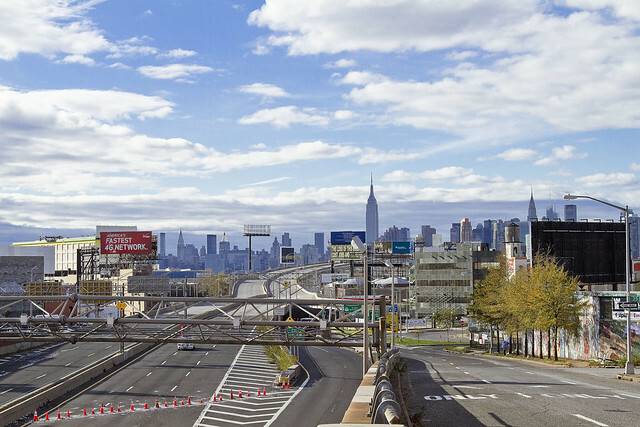 A short trip (via subway) to Greenpoint yesterday evening to celebrate the tenth anniversary of the estimable Newtown Creek Alliance, and today- glory of glories- a walk down Northern Boulevard. My destination was in midtown Manhattan, but I dared not risk walking the entire way as normal habit would demand, so I caught a different train after scuttling from Astoria to Queens Plaza. 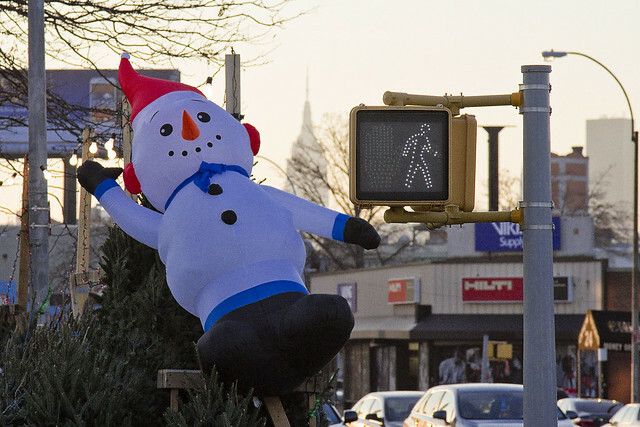 Along the way, I spied this inflatable representation of a snow homunculus, which grabbed my attention for some reason. 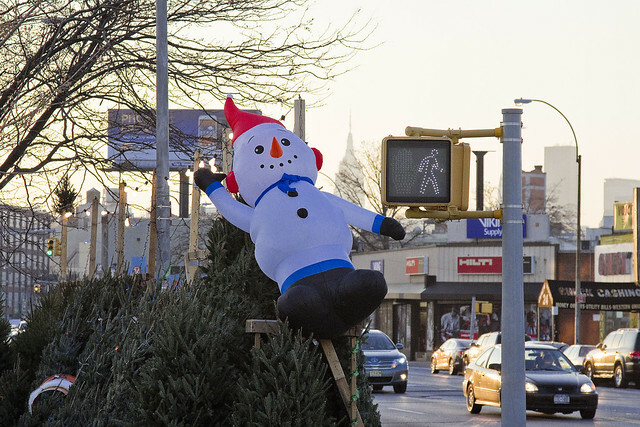 It adorned the shanty market of some french Canadian Christmas tree merchant, in front of the former Pathmark supermarket which has recently closed at the corner of 43rd street. Curiosity arises in me about these people, who camp out in their lots and run gasoline generators for light and heat on the sidewalks. Not enough to actually try and talk to them, but I’m curious nevertheless. 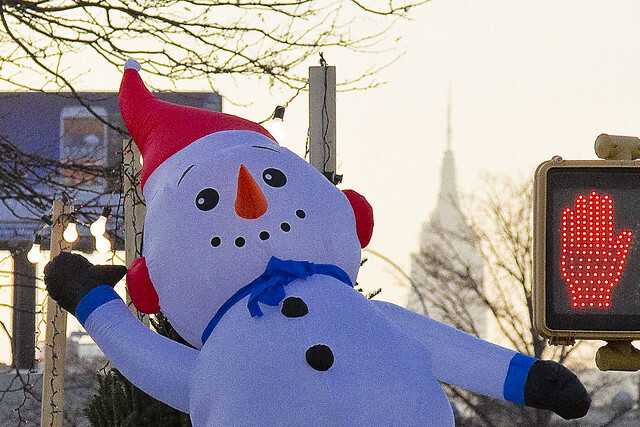 Growing up Jewish, the only part of Christmas that was kosher in my house were snowmen. My grandmother would adjure on the entire subject of the goyem and their Christmas mishegas and confabulate “yoyzel on de cross” with “Sanda Klause”, a tradition which my mother would gladly carry on. Secular, my parents once went so far as to buy a little plastic tree a few years after my Grandmother passed away. My father spray painted it blue and white, and mom decorated it with dreidels and white tinsel, and they stuck a star of David on top. They insisted we call it a Hannukah Bush. Personally, I always stuck to the snow homonculii, as nobody objects to them. This is a reblog of the post “indefinable odors“, which focused in on the little commented Hunters Point Avenue Bridge. Sorry for the repeat, fresh and new stuff is in the pipes. Down by Dutch Kills, one must persevere to maintain some inkling of hope for the future of mankind. Saying that, however, in its own way Dutch Kills is actually quite a lovely place- as storied industrial centers which have seen better days typically are. 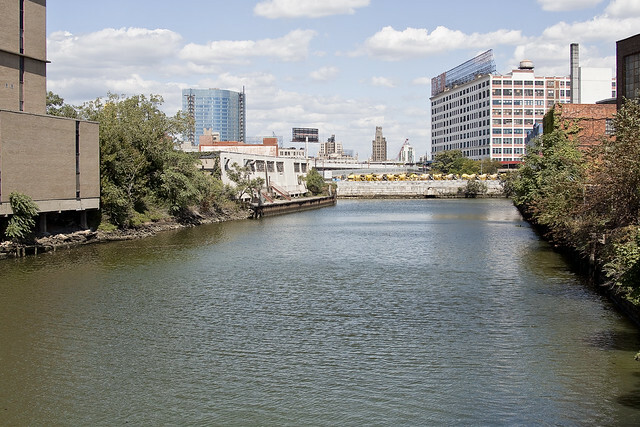 A canalized waterway, Dutch Kills is a tributary of that languid cautionary tale known as the Newtown Creek, and has been isolated for several seasons from its principate source by emergency bridge construction and a changing industrial landscape. I’m down here a lot of course, most recently in the “from some point in space” posting of November 3rd, which includes an intriguing set of high elevation shots of the area which I recently managed to capture. Seldom commented, the Hunters Point Avenue Bridge segments Dutch Kills neatly, and has done so for nigh on a century now. The marshes and streams which once typified the area before the advance of railroad and vast agglutination of industrial installation are long gone, relegated to subterranean sewers and masonry clad spillways, but a century ago- the Hunters Point Avenue Bridge (and its predecessors) allowed egress between the terrestrial isolation of the Long Island City center and the rest of western Queens. The NY Times, in 1908, commented that Long Island City might someday be known as “A city of bridges” due to the many crossings over the tributaries of the Newtown Creek and the presence of mighty Queensboro at its center. The Hunters Point Avenue Bridge, at mile 1.4, over the Dutch Kills has vertical clearances of 8 feet at mean high water and 13 feet at mean low water. The existing regulations for the Hunters Point Avenue Bridge in 33 CFR 117.801(d) require the draw to open on signal if at least a one-hour advance notice is given to the drawtender at the Grand Street/Avenue Bridge, the NYCDOT Radio Hotline, or NYCDOT Bridge Operations Office. In the event the drawtender is at the Roosevelt Island Bridge or the Borden Avenue Bridge, up to an additional half-hour delay may occur. The bridge owner, the New York City Department of Transportation (NYCDOT), submitted bridge opening log data to the Coast Guard for review. The bridge owner plans to operate these bridges with multiple crews of drawtenders. The two-hour advance notice should allow sufficient time for the crews to operate these bridges due to the close proximity of the bridges to each other. Recent yearly openings have been relatively low which will allow the bridge owner to utilize the roving crew concept and still meet the needs of navigation. The Hunters Point Avenue Bridge (the 1910 version) was configured differently than the modern structure when first built, although the original was constructed for some $95,214 from plans by the Scherzer Rolling Lift Bridge Company with the dirty work performed by the Duseath Engineering Company of 114 Liberty St. NY. As you’d imagine, there is a certain logic behind the esoterica presented about this obscure little bridge found in a literal “industrial backwater” in Queens. About 1900, most of the Newtown Creek was bulkheaded and occupied by about fifty industrial properties. Undeveloped or less developed sections without bulkheads included Dutch Kills, about 2,000 feet of shoreline in Queens just above Dutch Kills with two LIRR lighterage piers, about 1,000 feet of shoreline in Queens near the Penny Bridge, and about 3,500 feet of shoreline downstream of Maspeth Avenue in Brooklyn.15 Dutch Kills, and the Queens side of Newtown Creek, just upstream of Dutch Kills, were developed circa 1905-1912, largely through the efforts of the Degnon Terminal & Realty Company. 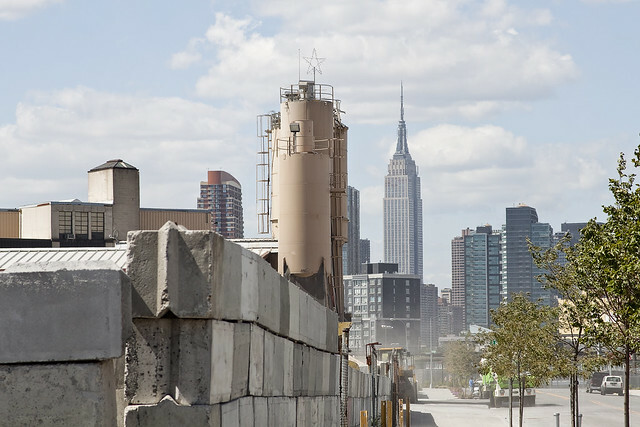 The Degnon firm created an industrial park with rail and marine access around Dutch Kills between about Hunters Point and 47th Avenue, Dutch Kills subsequently was included within USACE dredging projects. 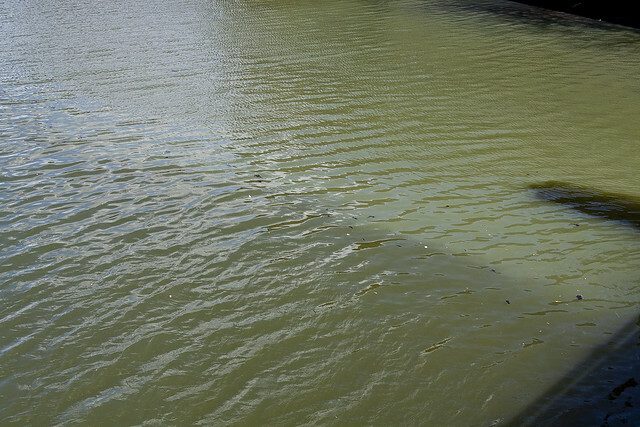 Without federal assistance, Degnon created a 150-foot-wide channel with 2,400 feet of bulkhead, including a turning basin. To create rail links to the development, Degnon helped the LIRR build a new 1,000-acre freight terminal circa 1907 along Newtown Creek east of Dutch Kills on property bought from Calvary Cemetery, including several short piers intended to handle heavy freight such as brick, coal, lumber, and ice. From this terminal, a private Degnon Terminal Railroad was created, largely through local streets. On newly filled marshy margins of Dutch Kills, Degnon Terminal & Realty promoted industrial development both on and away from the water. One iron works and several large building materials firms occupied the Degnon waterfront by the early 1920s. Reconstruction of the two movable bridges over Dutch Kills circa 1908-10 contributed to these developments. 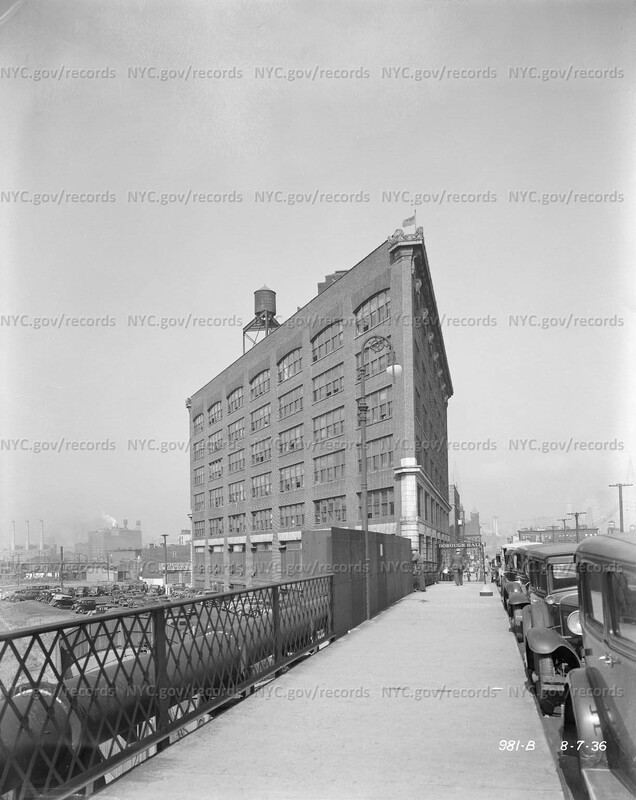 On other Degnon lots, large firms included the American Eveready Company and the American Chiclet Company, respective makers of batteries and candy.16 Facilitating this growth was the construction of the Queensboro Bridge (1909) and the start of the operation of the IRT subway line in 1917. Unfortunately, I can’t announce the news yet… Let’s just say that it would be a good idea to leave the 11th of December open, and that Long Island City is terrible in its grandeur during the winter months. More on this will be forthcoming by the end of the week. Edward Byrne began his civil engineering career in 1886 with the New York City Aqueduct Commission on the construction of the Croton Water Supply System. It is of interest that on this project he met Robert Ridgway, who also was destined to become a distinguished engineer and an outstanding civil servant. From 1889 to the close of 1897, Byrne worked on highways and bridges for the old Department of Public Works of New York City. On January 1, 1898, he joined the Department of Bridges and began a striking and noteworthy service which ended in November, 1933, with his resignation from the position of Chief Engineer of the Department of Plant and Structures (the successor of the Bridge Department), in order to assume the duties of Chief Engineer of the Triborough Bridge. His thirty-six years of service in the Department of Bridges, and its successor, the Department of Plant and Structures, may be divided into two periods. During this period, he was in charge of bridge construction and maintenance, supervising the construction of the Willis Avenue Bridge over the Harlem River, the Vernon Avenue Bridge, the Borden Avenue and Hunters Point Bridges over Dutch Kills, and the old bridge over Flushing River. I get asked all the time what these signs mean, what they indicate, and how seriously they should be regarded. The powers that be don’t make it easy to find out, for despite the “for more information” attribution, the City doesn’t go into much detail at nyc.gov/dep about them. Partly, this is due to the vogue followed by municipal authorities in recent years which allows private contractors to perform public work. The contractor is under no obligation to release their work into the public domain, as government workers are, and many important details about our metropolis ends up hidden behind corporate firewalls. Here’s a little of the Batman type detection required to penetrate a purposely obtuse subject, which is a skill I’ve been developing over the lifetime of this, your Newtown Pentacle. The Bowery Bay WPCP is permitted by the NYSDEC under SPDES permit number NY-0026158. The facility is located at 43-01 Berrian Blvd., Astoria, NY, 11105 in the Astoria section of Queens, on a 34.6 acre site adjacent to the Rikers Island Channel, leading into the Upper East River, bounded by Berrian Blvd. and Steinway Street. The Bowery Bay WPCP serves an area of approximately 16,105 acres in the Northwest section of Queens, including the communities of KewGarden Hills, Rego Park, Forest Hills, Forest Hills Gardens, North Corona, South Corona, Lefrak City, Elmhurst, East Elmhurst, Jackson Heights, Maspeth, Woodside, Sunnyside Gardens, Sunnyside, Hunters Point, Long Island City, Astoria, Astoria Heights, Steinway, Ravenswood, and Roosevelt Island. 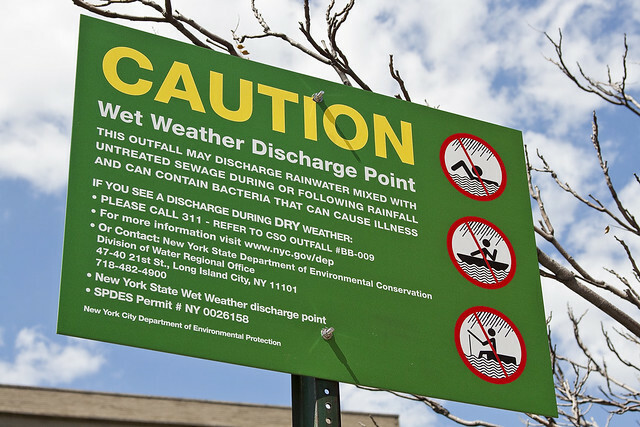 The Low Level service area contains 46 regulators, of which 19 interconnected regulators discharge to the Newtown Creek during wet weather through the 13 CSOs. 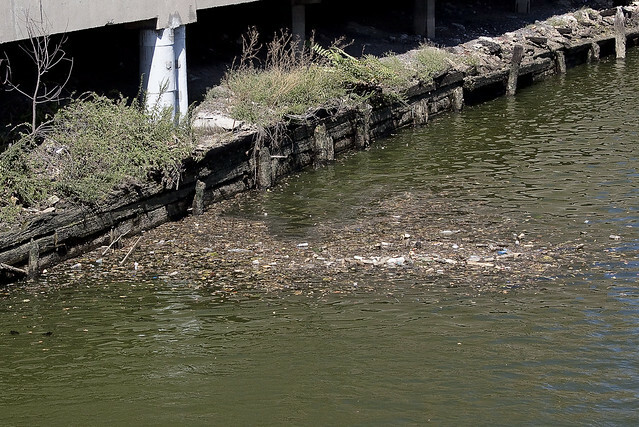 Of these 13 CSOs, 6 discharge to the tributary Dutch Kills (BB-004, 009, 010, 026, 040, and 042), and 6 discharge to Newtown Creek(BB-011, 012, 013, 014, 015, and 043). 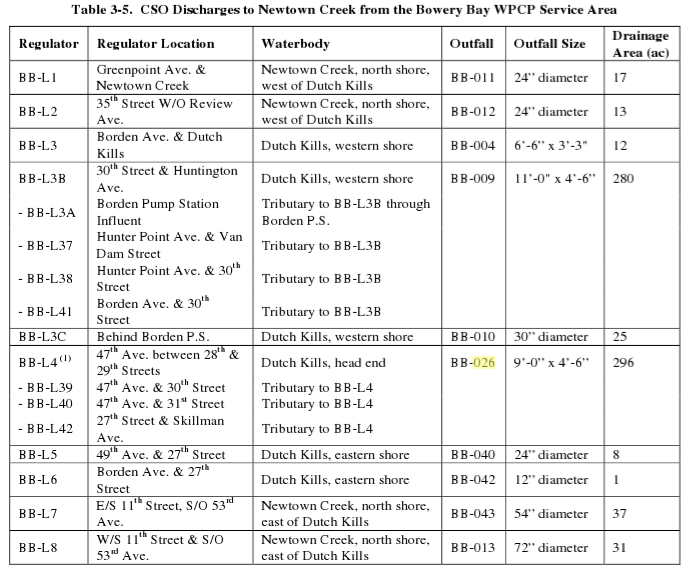 An additional 2-feet, 8-inches x 4-foot outfall, BB-049, is listed in the Bowery Bay WPCP SPDES permit as discharging to Dutch Kills near 21st Street, but no further information is available such as which regulator it is connected to. 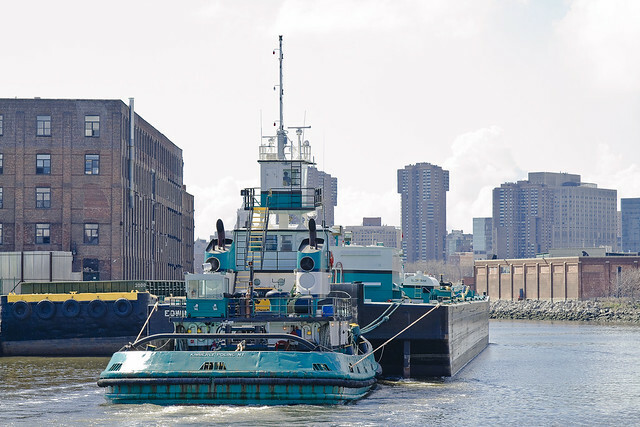 Gaze in wonder upon the fabled Newtown Creek of the 21st century, whereupon a tug of the Poling and Cutler towing organization wrestles a fuel barge in a westerly course toward the East River. A famously repeated phrase offered by your humble narrator boldly states that “in the late 19th and early 20th century, Newtown Creek carried more commercial traffic than the entire Mississippi River”, a statement which often causes listeners to roll their eyes. It is inconceivable, given the modern appearance of the Creek and its banks, to believe this statement. Some ask me whether or not tugs and barges even operate along the Newtown Creek in this dystopian future we have all found ourselves living in. Gaze, thereby, upon the Newtown Creek of 1903. 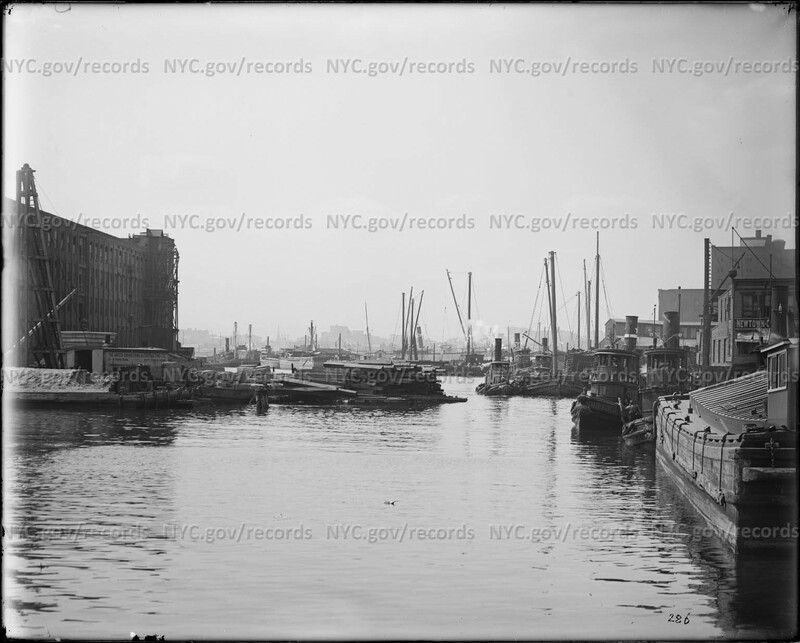 This is roughly the same spot, with the Chelsea fiber mill (modern day Manhattan Avenue and GMDC) on the southern (left) or Greenpoint bank and the Newtown Creek towing company docks on the right or LIC bank (modern day Vernon Blvd. street end). Another shot emanating from the NYC Municipal Archives, this is one of the few extant photographic records of the Newtown Creek’s zenith as the “workshop of America” at the height of the second industrial revolution. The back situation seems to be ameliorating itself, thankfully- and as this post is being written- has transmogrified from a crippling stiffness and intermittent sword blade of pain to a dull and omnipresent ache. Ultimately, this is a good thing, as I have actually managed to sleep without interruption for two days in a row and am able to move about in fine fettle. 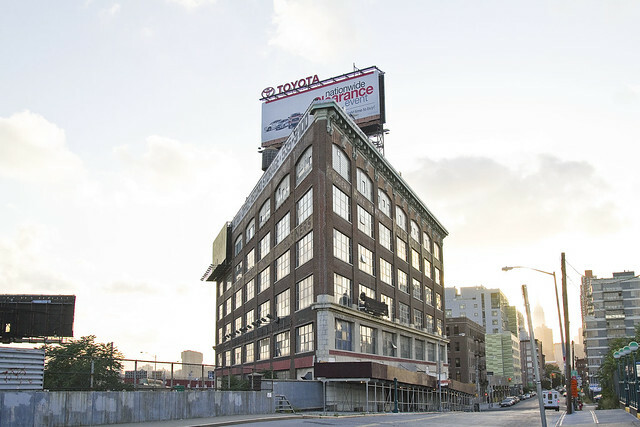 With luck, I will be able to resume my wanderings in a day or two, but for now- here’s another “Then and Now” shot, this time of the Paragon Oil building on Hunters Point Avenue in venerable Long Island City’s industrial quarter. It should be mentioned that I am fascinated by this building. This edifice- known sometimes as “the Subway Building” and others as the “Paragon Oil building”- was, in fact, Queens Borough Hall. Check out the January 2012 posting “high doors” for more on the structure. The shot pictured above emanates from the awesome collection of historic photographs made available by the NYC Municipal Archives, and was captured by a now anonymous municipal photographer in August of 1936. The center of Queens during the 1930’s, this was Borough Hall. Back then, the power brokers of the borough located themselves nearby the Newtown Creek and perched high above the southern extant of the Sunnyside Yard and alongside the Long Island Railroad tracks. Prior to this, the unofficial Borough Hall of Battleaxe Gleason was located at the Miller hotel (which would become the LIC Crab House) and the official one was on Jackson Avenue nearby modern day Court Square. During this infirmity which has struck me down, a twisting gimlet of overstressed tissue in my lower back (for those of you who haven’t read my endless complaints about it in the last week), an amazing amount of time has been spent combing the vast Internet in search of amusement and diversion. While doing so, a few images at the New York City Municipal Archives provided me with some intellectual whimsy. The shot above is quite modern, captured a few days after Hurricane Sandy. 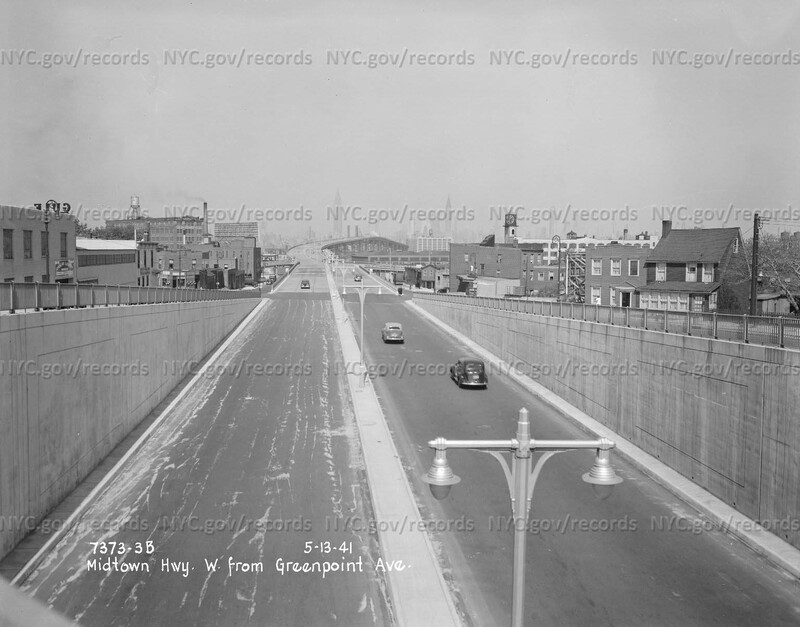 It depicts the “Queens Midtown Highway” section of the Long Island Expressway. The historic shot from May 1941, above, is shot from a few hundred feet south of my vantage point. Unfortunately, the spot where that photographer stood is now obscured by both a chain link fence and a highway sign which blocks the historic view. Of particular note in the 1941 shot are the presence of private homes, rather than industrial buildings, along the northern side of the highway. Also, the blanket of vaporous exhaust visible in the air of Long Island City is of some interest. As mentioned in yesterday’s post, a short interval of puffy individual shots is being presented over the holiday weekend. Partially, this is owed to a debilitating back injury suffered last week which has reduced your humble narrator to the uniform of the house bound invalid- sweat pants and bathrobe- the other is that every now and then an individual image presented earlier in the year got swallowed by the post it was published in. 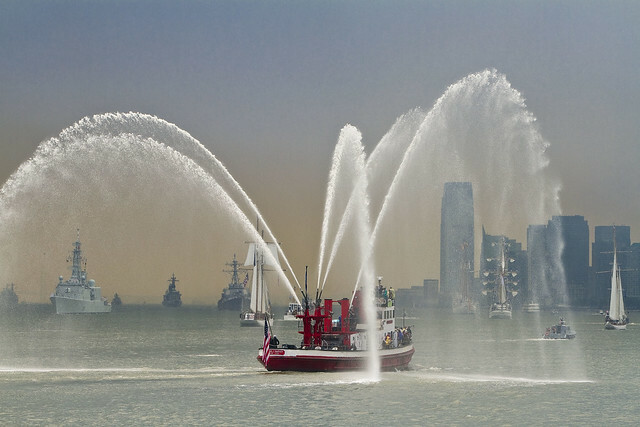 To wit, the storied John J. Harvey fireboat upon the Hudson during the Op Sail event in late spring of 2012. A bizarre atmospheric light is captured therein, wherein storm clouds literally opened around the procession of ships and provided a somewhat eerie atmosphere. Those of us in the Working Harbor Committee ascribe such events to the otherworldly abilities of our own Captain Doswell, referring to the phenomena as “The Doswell Effect”. Thanksgiving weekend is no time to burden you with cares or worries, that’s Walmart and your family’s job, so the Newtown Pentacle tradition is to kick back and present singular images which appeal to the sensibility and tastes of a humble narrator. Above, and I do believe that this shot has run before at this – your Newtown Pentacle, is depicted the corner of 31st street and Broadway in demimonde plagued Astoria. 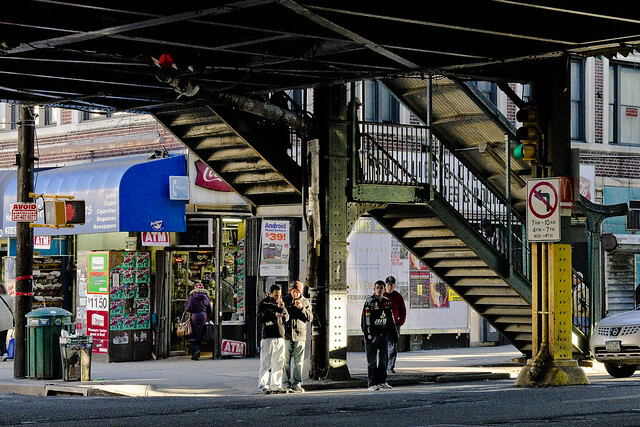 The structure, of course, is the the elevated track of the Subway. There’s just something about the light in this one which I really dig.